Lintels, being a key part of the build, are important to have choices with. 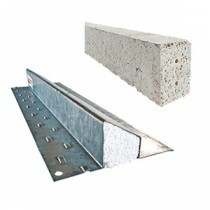 We stock both steel and concrete lintels in various lengths and different sizes. Our concrete lintels are all pre-stressed and in 2 different cross-sectional sizes; our steel lintels are suitable for a standard 100mm cavity but we can supply the entire range of lintels for all applications.